While some of us may be bored by Android tablets, Lenovo’s latest pair announced at CES 2019 have something worth to consider! At the core of it all, both the Lenovo Smart Tab P10 and M10 function just like any other ordinary Android tablet out on the market, but what makes this pair unique is that Lenovo throws in a speaker dock with Amazon Alexa integration! We checked out the P10, which is simply the better spec’d and more attractive looking slate between the two. Donning a metal meets glass construction, the P10 is surprisingly solid and one attractive looker given the price point it’s attached with ($300). 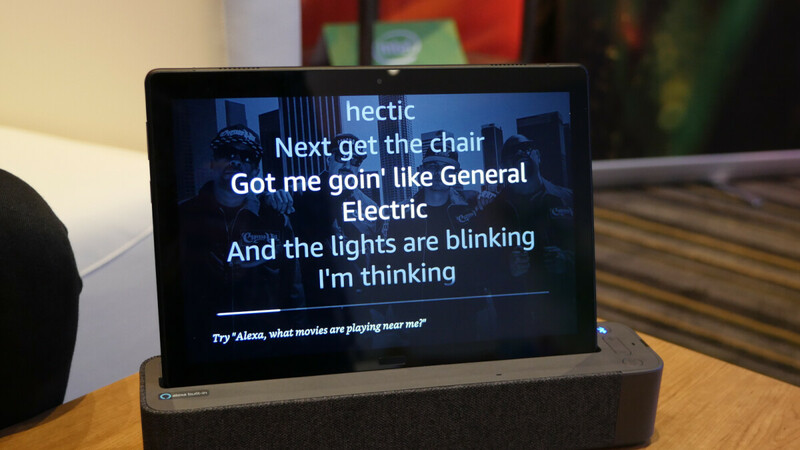 What makes the Lenovo Smart Tab unique is the included Lenovo Smart Dock that’s packaged with the purchase, turning it into an Alexa powered speaker of sorts. You’ll leverage Alexa for controlling other smart home devices, while also acting as a versatile assistant in the home! Speaking of the dock, it’s a nice addition because of the sound performance it’s able to deliver. In the room we were checking it out, it’s accompanied with a reasonable level of bass to make the overall quality sound punchy – thanks in part to how they’re tuned by Dolby for cinematic sound. On top of that, the three far-field microphones embedded are powerful enough to recognize our voice from a good distance away to perform different actions. For the home, the Lenovo Smart Tab is a practical all-in-one solution, covering a multitude of needs. If you’re looking to save some money, the $200 lower spec’d Lenovo Smart Tab M10 is still a decent offering, but the P10 isn’t too shabby either at $300. The P10 boasts the better-looking design, larger 7000 mAh battery, quad Dolby Atmos speakers, fingerprint sensor, and double the storage capacity at 64GB. Both tablets feature 10.1-inch 1920 x 1200 LCD IPS displays, powered by the Qualcomm Snapdragon 450, and are running Android 8.0 Oreo. They may seem like ordinary Android tablets, but the inclusion of the speaker dock, Alexa integration, and affordable prices make them more value centric. Great use of a tablet when not being used. It has both Google Assistant and Alexa.